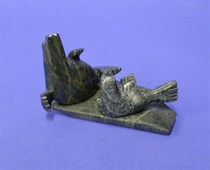 This stunning Inuit Art Sculpture was created by Master Carver Bart Hanna from Igloolik, Nunavut. It is approximately 5 feet long and 7 feet tall to the tip of the mast. Sedna graces the Migration piece, her exquisite hair is being groomed as she sails over the water. Here we can see the detail on the rudder. Here we see the detail on the Shaman drum dancer, the Ivory mast and the exquisite Ivory and Baleen dragon's head adorning the bow. 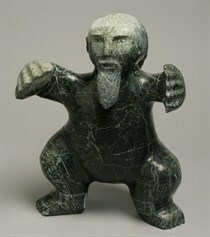 Bart is well known for Inuit Art sculptures of Sedna, drumdancers and shamanism. 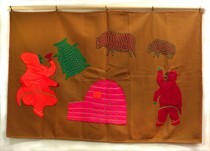 His unique imagination and style can be seen throughout "Migration". 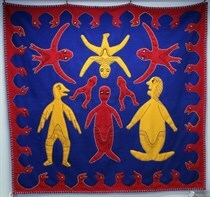 Northern Images has been promoting Inuit, Dene and Metis Art and Artists for over 40 years. 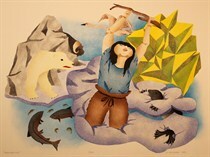 Our Yellowknife gallery is currently featuring the 2016 Cape Dorset Print Collection along with a vast assortment of prints and originals by artists such as Antoine Mountain, Bill Nasogaluak, Bern Will Brown, Dorothy Francis, Germaine Arnaktauyak and Mona Thrasher. Contact the gallery directly for more information.